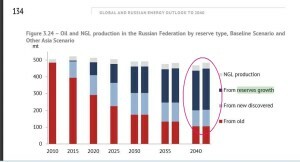 Russia’s crude production from today’s oil fields will have declined 80 per cent by 2040, suggests the Russian Academy of Sciences in its latest energy outlook. Of course one cannot come up with a prediction of sorts just like that – most certainly not with the country’s most important export good. The message is hidden by a wild card that goes by the name “reserve growth”. 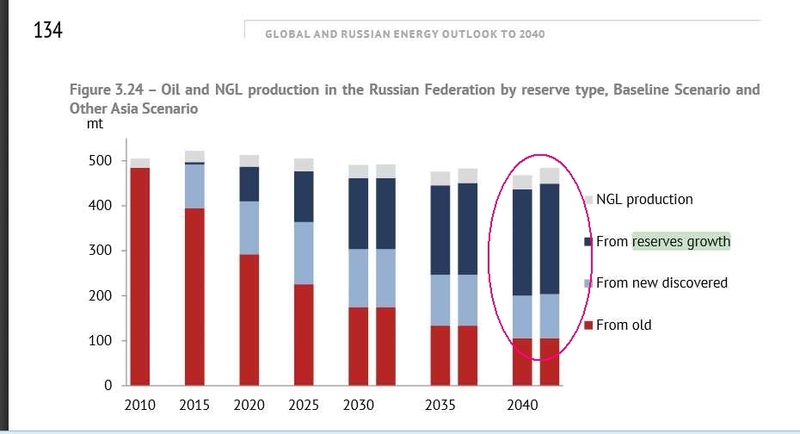 The projection basically means, that four fifths of today’s productive oil fields will be depleted by 2040. To save appearances, the research study maintains, that production from so called reserve growth will contribute more than 230 million tonnes C+ NGL in 2040. This is something, Western peak oil deniers too have put forward, to stress that there will no shortage of fuel energy in the foreseeable future. Up to a point reserve growth is a legitimate, reality based concept, which reflects progress in exploration and production and a continuously better understanding of mature deposits. But reserve growth clearly can be no “panacea” for a dwindling ressource base. Despite their hidden – and at the same time very discernible – message, the authors of the report do not expect crude oil prices to pick up over the next 25 years. Barrel prices will be glued to 100 Dollar going forward from now on, they think. Hat Tips to peakoilbarrel and Ron Patterson for making me aware of the report.